Start: 7:00 - 9:00 A.M.
Distances: 26, 50, 73, 84, 90, and 100 miles. The 10th Annual Stagecoach Century Stampede is now safely part of Wild West history. The 2014 Stagecoach will be remembered as the day Stagecoach Riders finally tamed the Wild West. Weather stepped outside it's starring role, for the very first time. Might have been Mother Nature's 10th Birthday gift for all riders touring the Great Southern Overland Stage Route of 1849. This Round-up email/Event Director Report summarizes the highlights of the 10th Annual Stagecoach Century. * Registration Now Open for the 6th Fiesta Metric! We send our most Sincere Gratitude to all Stagecoach Riders, Vol's, and Sponsors. In particular, we thank the Imperial Valley Desert Museum Vol's (Ocotillo) for staffing the Start & Finish & Rest Stop #1, Shelter Valley Citizen's Corp. Vol's for staffing Rest Stops #3, #4, #5, and the Lunch Stop. Thanks also to the Desert Chapel sign crew, and San Diego Knickerbikers at Rest Stop #2. This year, 483 Registered Riders accepted the Stagecoach challenge. The field included riders from 18 States, including the Sunny & Warm states of CO, ID, IL, MA, MO, NJ, NM, NY, OR, UT, WA, WI, and WY. Other (warmer) states included: AZ, CA, FL, GA, NV. On Saturday, 419 riders arrived and rolled onto the course, with 358 Full Course, and 61 Short Course riders. A fantastic 271, or 75.7%, completed the Full Century. That number will likely rise. Here's the link to the Full Century Finishers List. Riders who registered for the Full Century, completed it, but did not check in with the Timing Booth, or if your name is missing, please email Jim with your Bib#/Name in the subject line. The Full Century Finishers List will be updated until Feb 1st, when the list is FINAL and no additions will be made. Special Congrat's to Karen Finkelstein & Courtney Krehbiel, from Carlsbad, CA, on completing their 24th (of 25) Shadow Tour Century rides. Eeee-Haaa! Honorary "Stagecoach Sheriff" Rick Stewart, extended his perfect attendance streak to 10 Stagecoach Centuries. Rick is the only rider completing all January Stagecoach Centuries. Note: Riders may verify past Stagecoach rides, as well as other events, by reviewing past Rider Lists. Regardless of distance ridden, or previous Shadow Tour participations, Congratulations to all Stagecoach riders on your personal achievement! Stagecoach is most certainly an EARN IT! century. Most cyclists have heard of Stagecoach; either by direct participation, or by intimidating reputation. Fear & Respect ride side-by-side at Stagecoach--just ask riders from 2006 (Big Wind), or 2007 (Big Chill), or 2013 (Chill Zone). 2014 Riders knew all this going in, and still accepted the challenge head-on, with eyes wide open. We couldn't be more proud of YOU! Thanks for participating in Stagecoach. The 2014 10th Anniversary ride will forever be known as the ride where the Wild West was tamed. Mother Nature's Birthday gift to Stagecoach riders was a delightful spring-like weather interlude in January. Temps were in the low 40's F at the start, rising to 79F by mid-afternoon. Even more remarkable, were the calm winds. Surely every rider felt wind out there. But contrasting with past blustery & sustained winds from the North of 10-15 mph, gusting to 30+ mph (and beyond! ), this was absolutely a "calm" wind day. Riders arrived in Exceptionally High Spirits on Sat! Riders heeded safety warnings, dressed warmly, and did their homework ahead of time. Most actually read the emails & Final Rider Instructions. Bravo! Riders pointed out hazards and rode (mostly!) single file, and well to the right. There was a fantastic Full Century 75% Full Century Finish rate AND NO MAJOR INCIDENTS OR ACCIDENTS! Nice weather aside, conditions at Stagecoach have never been "easy" and likely never will be. If weather didn't zap you, the dry desert air, maddening swirling winds, micro-bursts, wind devils, were all out there, chipping away. The course itself is a tough 100-mile route with 5,139 feet of climbing--heavily front-loaded, in mid-Jan, when few riders are at peak form. There was that cranky early 10.5-mile climb up to Canyon Sin Nombre & the Carizzo Badlands Overlook. Then that gnarly Campbell Grade "Wall" at mile 30, followed by a grinder climb to the course high point, 2,685 ft el, past Box Canyon. The San Felipe Grade took it's toll for 4.4 miles to the turnaround point. Then came the downright nasty Sweeney Pass Climb with it's hairpin turn at mile 87. Finally, like a sweet & sour desert, came the always fun, bone-rattling, 96th mile. Giddy Up! Yet, all of this is what gives Stagecoach its special character, and make it even more Worthwhile & Rewarding. The Stagecoach Finisher's Medal can only be EARNED with enormous Determination, Commitment, and Effort. Coincidentally, the very same traits associated with success in all walks of life. We hope Stagecoach will rank as one of your most memorable and positive 2014 cycling experiences. Many riders asked about the web posting indicating this may be the final Stagecoach Century in it's present form. You deserve an explanation. Many cycling events have emerged over the 10 years of Stagecoach. Some rides promote beer gardens, or large marching bands, others try to copy various European ride themes. While the popularity of these events varies widely, the cumulative effect has eroded participation at Stagecoach and other high quality pure-play rides. Stagecoach has always been a "Rider's Century". The focus is on delivering an exceptional cycling experience on a Scenic & Challenging course. On roads less traveled--just 2 stop signs, and low vehicular traffic. Stagecoach production costs, with all it's embedded features, has risen every single year, yet participation has declined. To level with you: Keeping Stagecoach in it's present form requires 700 Riders. We're committed to producing the 2015 Stagecoach Century! We invite each of you to join us, and to recruit at least one more rider to join you. If just half the field climbs on board for this, we'll have over 700 riders and Stagecoach is back on track--with a bright future! If you have promotional suggestions, or know of a company, organization, or even individual, that may have interest in Stagecoach Sponsorship, please feel free to contact me directly. Thanks for a great decade of Stagecoach! The Stagecoach Time Trial was timed using high tech timing chips by CEP Timing. Owner Jason Kornetsky, Official Timer of the El Tour de Tucson, was personally onsite to time the event. Jason also times our Palm Desert Century. Preliminary Results are posted here. Results go Final on Fri, Jan 24, '14. Timed riders tore up the Great Southern Overland this year. Both Solo Winners lowered the Course Records, as did the the Men's Open Team Time Trial Winners. On the Women's side, Lina Ramos, La Jolla, CA, stampeded her way through the course, defending & lowering her own Course Record set in 2013 (5:36:29), with a blazing time of 5:25:08. 2nd Place Solo Women's Finisher, 19 y/0 Gina Ricardo, LA, CA, also eclipsed the previous CR, by over 5 min. 3rd Place Solo Women's Finisher, Sherry Rennard, Costa Mesa, CA, also slipped under the previous CR, by 1 second. Way to kick it! On the Men's side, Adam Bickett, Solana Beach, CA, aka Wildebeast, rocketed to Victory. Incredibly, he gapped down an already Pro-Class Course Record, set by Dana Skriver in 2013 (4:27:16), with his winning time of 4:23:34. Adam is an Ultra Distance Amateur Racer. His long list of victories include the Solo Furnace Creek 508, Solo HooDoo 500, and 8-Man RAAM. His training downloads on Strava are legendary. He once rode the Stagecoach Century course in 115F July heat in under 5 hours--on his 1st attempt. Event Director Jim rode a practice Stagecoach TT with Adam and could not hold onto his wheel! At the Finish Line on Sat, Adam said he did not stop for water, but carried a full Camelbak the whole way. His strategy was to bury himself to the turn. And that's exactly what he did, hitting the turn in 2:15:56, nearly as fast as the winning 4-man team (2:13:36) Lest you think he did not suffer, look closely at the Finish Line photo for the face of Pain & Effort. Well Done Adam! More Fireworks exploded on the Men's Open Team Time Trial. 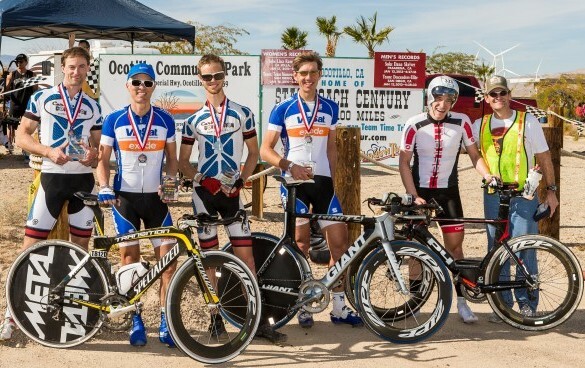 Former TTT Course Record Holder Team Broadcom, Irvine, CA, roared back from their 2nd Place 2013 finish. They smashed the previous CR set in 2013 (4:38:33), held by long-time friendly rival, Team San Diego Descenders. Upon finishing, the waiting began to see if any other team would post a faster result. Only one did. Team Carbon Connection with Metal, San Diego, CA rode together for the first time and pulled off a stunning win in a new Course Record time of 4:17:10. Yes, 4:17:10, that's a 23.3 mph average speed! A genuine Wild West Course Record for the ages. Veteran Stagecoach rider & Team Captain, David Bruemmer, Carlsbad, CA, Palm Desert Century Champ 2011 (CR), 2013; Giro Di San Diego Champ, 2013; Breathless Agony Champ, 2012 (CR), 2013 (CR), assembled a Dream Team, just days before the ride. Andrew "Metal" Danly, Jeremy Gustin, San Diego, CA, and Garrett Meier, Bonsall, CA rounded out the 4-man open team. Each of these incredible riders routinely chase & set KOM's through out San Diego County on Strava, averaging over 18 mph on Double Century rides with 15-20,000 ft of elevation. Post-race, they savored their victory in front of the Stagecoach sign, and answered questions & mingled with riders for over an hour. Champions & Gentleman. Congrat's to all Champions! Last Chance for Stagecoach Jerseys! You EARNED IT!, now's your chance to fly the colors. In response to your requests, a 2nd Production Run of 2014 Stagecoach Jerseys will be sent to Voler at COB on Fri, Jan 24, '14. complete, and fax to 858-356-9596. 2. Download CC Auth Form, complete, date/sign. Scan & email to Jim (Support@ShadowTour.com). 3. Call Jim directly with orders at 858-692-6220. Please have Credit Cards ready if you call. The price is $75/jersey, which includes tax + free shipping. The 2nd P/R of jerseys will be mailed in mid-March. The mail date will be posted on the Stagecoach webpage in the "Latest News" section. Last Chance "Tec" T-shirts: There are a few remaining 2014 Stagecoach Century Hanes Cool Dri tagless T-shirts remaining in inventory(ML-2, WL-1). There's a wider selection of Palm Desert Century T's as well. These custom "Tec" T-shirts are Full-Color front, B&W logos on back, extra wide 14 inch screening. "Tec" T-shirts are the state-of-the art for comfort, wicking properties, and rapid dry interlocking fabric. Extremely comfortable 4.1 oz. Leaves traditional cotton T's in the dust. The print colors stay bright virtually forever. It's a perfect base layer for year-round cycling. Women's sizes have a tapered cut. The first time you pull on a Tec T, you'll understand what the buzz is all about! To order, please call Jim at 858-692-6220 to inquire about sizes and make Credit Card payment. Price is $25/T-shirt, which includes tax & free shipping. 1st Come, 1st Served! The Volunteers for this year's ride were primarily from the local communities at the Start/Finish (Ocotillo) and the halfway point (Shelter Valley). Both of these communities have been involved in all 10 of the January Stagecoach Century rides, plus 2 Spring editions. Many riders expressed their gratitude at the ride and placed cash in the donation jars. For the rest, please think back to the ride: Wasn't it nice having experienced Volunteers at every single Rest Stop? How about those progressive pots of Coffee, Hot Chicken Noodle Soup & Chili at the turn? And a warm Community Center to enjoy your lunch. For riders needing a lift back, pretty cool to have Vol's standing by for that too, right? Then, at the Finish Line, you were Welcomed Home, with cowbells & whistles, then got your Finisher's Medal handed to you, instead of going to a booth. Finish Line Vol's also insured you were recorded as a Full Century Finisher. And for those with timing chips, the Vol's had your back again. Every single Timing Chip was retrieved at the Finish Line, something unheard of in the world of timed events. Stagecoach Vol's were onsite from before 5:00 A.M, until well after dark, working the event. But they also held meetings and made coordinations weeks in advance. They Care About YOU! Currently, total rider Donations to Shelter Valley & Ocotillo are under $500. Let's turn that around! Please click on the links below and do what you can. A little goes a long way. These groups are 501(c)3 Non Profits. None of your donation goes to Shadow Tour in any way. Thanks for your Generous Support! Next up on the Shadow Tour ride calendar is the 6th Annual Fiesta Metric Century on Sat, Jun 7, '14. The Fiesta Metric is at the opposite end of the Stagecoach intensity scale. It's a family-oriented Mellow Summer Ride, with a Start & Finish in Downtown San Diego, by the Bay. The ride visits the waterfront, Bonita, Chula Vista, Otay Lakes, and Jamul on an easy out-and-back course. There's a discount coupons at the bottom of this email for past Shadow Tour riders. Sign up today & Save! Referrals: Stagecoach is a unique event in many ways. Our #1 source of new riders comes from previous riders telling their friends. We are very proud of this. For 2014, more than ever, we need your referrals to encourage more riders to participate in Shadow Tour century rides. Please forward this email to any of your friends who may be interested in joining one of our rides. Pearl Izumi: Pearl Izumi was a Proud Exhibitor at the Stagecoach Century! Stock up on high tech winter cycling gear at Factory prices. Bring your Goodie Bag Pearl Izumi Coupon to our Del Mar store for extra savings! 858-793-0366. Ranch Cycles: Ranch Cycles, located in Rancho Santa Fe, was a proud sponsor of the 2014 Stagecoach, and is the closest brick & mortar bike shop to the Friday Rider Packet pick-up at the DoubleTree. You're invited to call or visit the store soon. Be sure to mention Stagecoach for Discounts & Specials. 858-832-8217. Holland Cycles: Master Frame builder, Bill Holland, designs, measures, and builds your Holland bicycle optimized for your unique dimensions, geometry, and riding style. Call Bill, Charles, or Cody to learn more at 619-469-1772. SCS Photoworks: Official Stagecoach photographer. Traction Bicycles Mobile Repair: Was at Stagecoach providing Mechanic & SAG support. Traction Bicycles specializes in all bicycles, from a child's first bike to high-end tri-bikes. Call owner Matt McDaniel for an appointment at 619-379-5150. A most sincere, "Thank You" and "Congrat's" to all hearty 2014 Stagecoach Riders. We're already hard at work preparing for the 6th Annual Fiesta Metric Century in Downtown San Diego. We hope to see all of you on the Start Line on Sat, Jun 7th, '14 in San Diego! 2014 Men's TTT & Solo Champions! Score "Best Deal" prices by registering now for the 6th Annual 2014 FIESTA METRIC CENTURY on Sat, Jun 7, '14 in Downtown San Diego, CA. We're pleased to offer a special discount to past Shadow Tour riders and members of the Interest List. Sign up Today & Save! Enter promocode FIESTA10 when you register online. It's the last step, so use care not to miss it. The promocode is also valid for Walk-up Registrations. The discount applies to entry fee only. May not be combined with other offers, and is not retro-active.